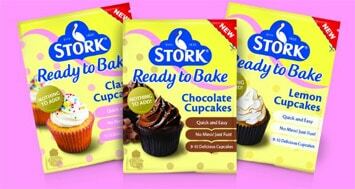 Unilever in the UK is launching a new line of ready-to-bake chilled liquid cake mixes under its Stork brand. The company said that the line is a “first of its kind” cake mix. The pouched baking mix requires no added ingredients and can be poured directly into cupcake cases. The range includes three variants: chocolate, lemon and classic. Announcing the move, Unilever described the new Stork baking mixes as a “convenient option” for “consumers who are without the time, skills or confidence to bake”. Pedro Costa, brand manager for Stork at Unilever UK, said: “We know that lots of people enjoy baking with 41% doing just that every fortnight, but for some consumers time and experience are often barriers. Unilever revealed last week that it is planning selling off its spreads business, which includes Stork as well as other spreads brands such as Flora and I Can’t Believe It’s Not Butter. The news came as part of a strategic review launched by Unilever management after the Anglo-Dutch group rebuffed a takeover approach from Kraft Heinz. The baking mix category is in steep decline in the US, posting a 3.4% fall in sales in 2015. Mintel predicts it will continue to contract at this rate into 2020. As baking sales decline in the US, and increasingly busy consumers have less time in the kitchen, Unilever could be wise to find a way to draw more people into the kitchen. However, the story is different on the other side of the Atlantic. In the UK, Mintel found that launches of bakery ingredients and mixes posted 100% growth from 2009-2012, 40% of which carried “ease of use” claims as of 2012. Germany accounts for 17% of new product activity in the baking mix category in Europe, followed by the UK (14%), France (13%) and Italy (10%). Given the timeline for new product development, Unilever must have had these products in the pipeline before its ailing margarine business was earmarked for sale. The new Stork product could be a way to add value to the division ahead of a divestment that could sell for more than $7-billion.